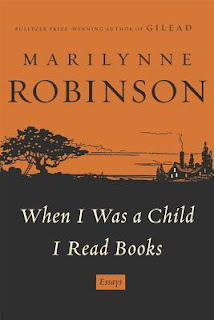 Weekend reading: Marilynne Robinson's When I Was a Child I Read Books, a compilation of essays on faith, American generosity and liberality, and many more. Ms. Robinson writes about her upbringing in Idaho, where solitude was considered a virtue rather a moral failing. This stands in contrast to the prevailing suspicion that a person who likes to be alone must be depressed. It seems to me that, within limits the Victorians routinely transgressed, the exercise of finding the ingratiating qualities of grave or fearful experience is very wholesome and stabilizing. I am vehemently grateful that, by whatever means, I learned to assume that loneliness should be in part pleasure, sensitizing and clarifying, and that it is even a truer bond among people than any kind of proximity. It may be mere historical conditioning, but when I see a man or a woman alone, he or she looks mysterious to me, which is only to say that for a moment I see another human being clearly. I remember my introverted friends and how I like to torture them with unwanted attention. So far they have not punched me in the face. I still see them clearly.